About 40 species in Eurasia and northern Africa. In the FSU 13 species, of which most are Caucasian-Western Asiatic: S. monanthos C. Koch, S. rosenii C. Koch, S. winogradowii Sosn., S. hohenackeri Fisch. et C. A. Mey. and S. mischtschenkoana Grossh.. The other group consists of S. vvedenskyi Pazij, S. puschkinioides Regel and S. raewskiana Regel, all are Central Asiatic endemics. Of the remaining species, S. autumnalis L., S. bifolia L. and S. siberica Haw. are of European, and Western Asiatic distribution. All species are ornamental. Caucasus (southern Transcaucasus) and northern Iran. Dry stony slopes, mountain meadows. Plant 10-15 (-30) cm. Bulbs ovoid, grey-brown, 1.5-3 cm diam. Leaves 3-4(-5), linear, sulcate, 10-12 cm long, nearly 1 cm broad. Flower stem with 2-6 broadly campanulate, white-azure flowers up 2-3 cm diam. V - early spring (St. Petersburg April), to mid summer. Fl - early spring for 3 weeks. Fr - early or mid summer. P - by bulblets and seed, comes into flower in the third year after sowing. 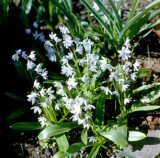 Plant on well-drained soil, in a sunny or semi-shaded position. Recommended for rock gardens and group planting for spring decoration. Z 4. New. Caucasus (western Transcaucasus) and northeastern Turkey. In subalpine meadows and forest clearings. Plant 15-20 cm. Bulbs ovoid, violet-brown, 1-3 cm diam. Leaves 2-3, up to 12-15 cm long and 1 cm broad, linear, sulcate above. Flower stem with 1-2 large azure-white flowers. They are similar in shape to cyclamen flowers, up to 3.5 cm diam. V - early spring (April in St Petersburg) to mid-summer (June). Fl - early spring. Fr - a month later. P - by seed and daughter bulbs. Plant in groups. Prefers well-drained soil and a sunny or partially shaded position. Good for the rock garden and for cut flowers. The gem of the genus. Z 4. New. European part of Russia (southern regions), Caucasus and Turkey. In glades and among shrubs, in forests of low mountain zone. Plants up to 15-20 cm. 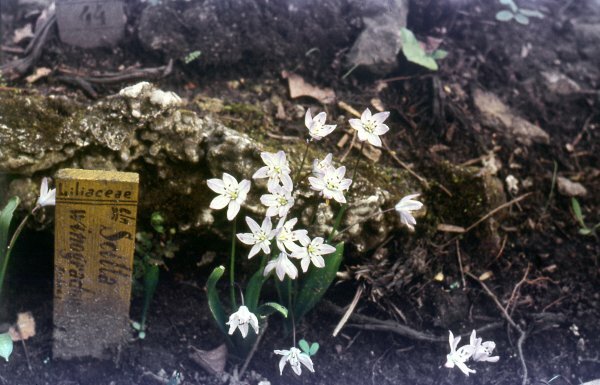 Bulbs dark brown, widely conical, 2-3 cm dam. Leaves 3-4, up to 10-15 cm x 1-2 cm, linear, sulcate above. Flower stem with 3-6 bright blue up to 2.5 cm diam. Flowers widely funnel-shaped. V - early spring (March, April) to mid-summer. Fl - April. Fr - June. P - by seed and daughter bulbs. In cultivation since 1796, widely naturalized in gardens and parks of Europe. Undemanding as to habitat. Z 3. Differs in flower colour (dark blue) and size (flowers and leaves are larger). It occurs in the eastern Transcaucasus. S. monanthos C. Koch is related to S. siberica, but smaller in size. Flowers 1-3, pale blue. It occurs in the western Transcaucasus. Z 4 (3). New. Central Asia (western Pamiro Alay). On rocky slopes at 1,500-3,400 m.
Plant 10-20 cm. Bulb widely ovoid, 1.5 cm diam. Leaves 2-3, elongated-spathulate, 1-2 cm wide. Raceme of 3-10 bright blue flowers. Pedicels of lower flowers twice as long as flowers. V - early spring (March-April) to mid summer (July in St. Petersburg). Fl - mid-spring for 2-3 weeks. Fr - a month later. P - by seed and daughter bulbs. Requires dry soil in the winter period. Grows in partial shade. Z 4. New. Caucasus (western Transcaucasus) and northeastern Turkey. In forests. Plant 10-30 cm. Bulb ovoid, 1.5-2.5 cm diam. Leaves 3-4, 0.5-1.0 cm wide. Scapes 1-3. Racemes few-flowered, sparse. Flowers large, ca. 2 cm diam., light blue with dark stripes. V - early spring to mid-summer. Fl - mid-spring (May in St. Petersburg). Fr - June. P - by seed and daughter bulbs. Can grow in partially shaded sites on well-drained soil. Z 4 (3). New.